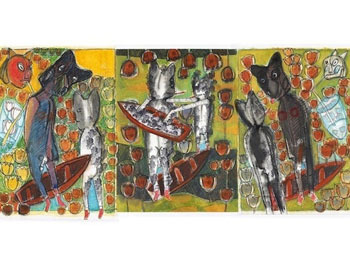 Jerry Allen Gilmore’s most recent work reflects his realization that life’s every movement possesses a humorous bend in the river, where “one may be given aid by animals, magicians and shamans or menaced by devils, clowns and bumble bees. Where you go depends upon where you have been, and where you can go depends upon what you can imagine.” As with his previous work, his new pieces are autobiographical, full of repurposed and retraced narratives, such as identity, sexuality, spirituality, beauty and mortality. A prolific painter and printmaker, Jerry Allen Gilmore has exhibited internationally since 1978, including such prestigious venues as the Walker Art Center in Minneapolis, The Phipps Center for the Arts, DeVos Art Museum of Northern Michigan University, the Bemis Center for Contemporary Arts, and Rochester Contemporary Art Center in New York. His work is included in numerous public and private collections, including the Denver Art Museum, the Scottsdale Public Art Program, the Arizona State University Art Museum, Tucson Museum of Art, and the State of Utah Fine Art Collection. Gilmore earned his MFA in Painting and Drawing from Washington State University in 1981 and his BFA in Fiber and Painting from Western Washington University in 1979.